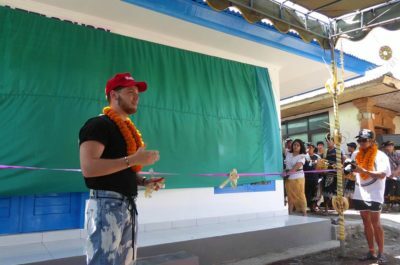 Bali Children’s Project proudly opened another new preschool and kindergarten in Bali, with a special surprise – rising music star Bazzi opened the school to a rapturous community. 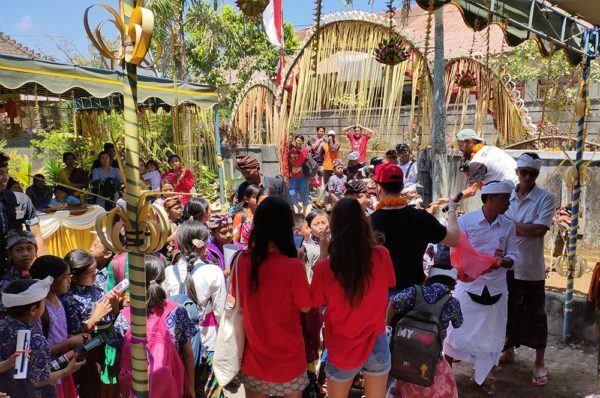 Bazzi, who has amassed over 100,000,000 Youtube views, visited with Karmagawa to see Bali Children’s Project’s work – and he wasn’t disappointed! 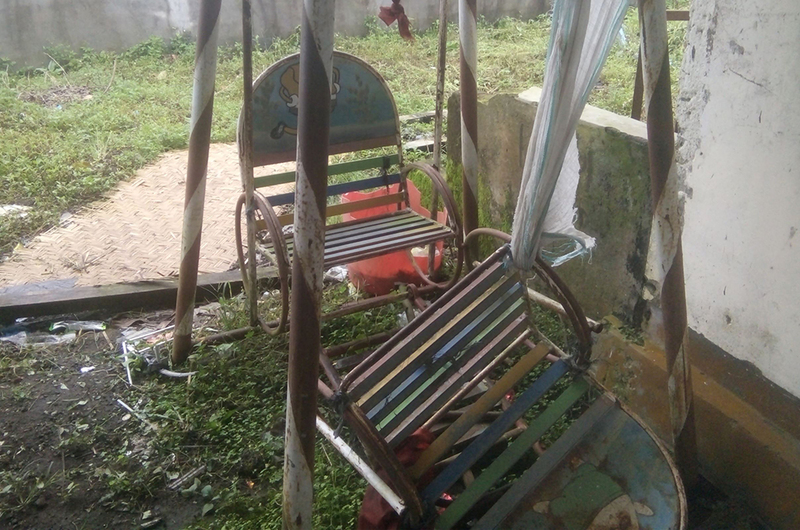 Widya Kusuma Kindergarten, nestled in the mountains of Bali was in terrible condition. As kindergartens aren’t compulsory in Bali, many schools operate from community buildings and operated by women from the local village. 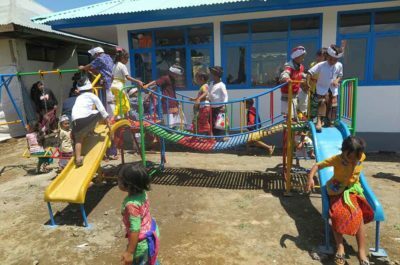 Deep in the orange farming mountains north of Kintamani, the village had started its own preschool and kindergarten for its young learners. 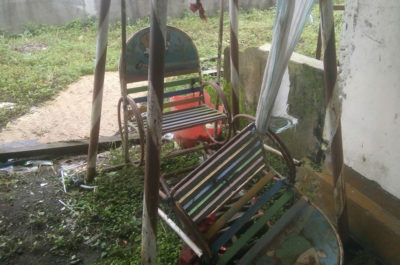 The local elementary school had donated an old teacher’s house to be used by Widya Kusuma Kindergarten. Teacher’s houses are common in elementary schools. As most teachers live elsewhere, the buildings often go unused and become derelict. 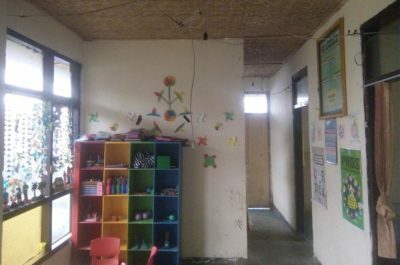 Despite the roof caving in, a poor layout and a lack of supplies, the building was better than nothing, so Widya Kusuma Kindergarten moved in. With 30 children cramped inside the dark and dangerous room, something had to be done. After meeting the community, Bali Children’s Project knew that they were in great need of support. The community had set up the school and showed dedication in providing early stage education, despite the barriers. Over three months, we renovated the school and transformed it into an incredible new facility. 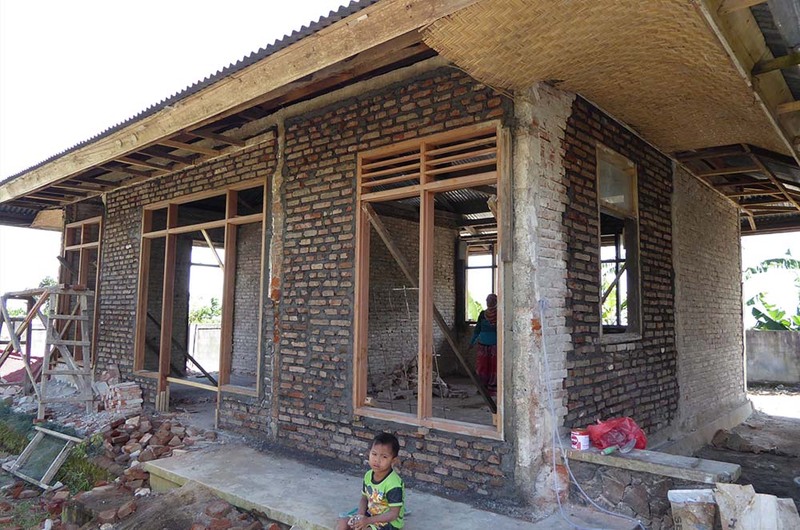 Keeping the same foundations and outer structure meant that we were able to renovate everything for just 16,000 USD. However, the renovation was not a simple task. 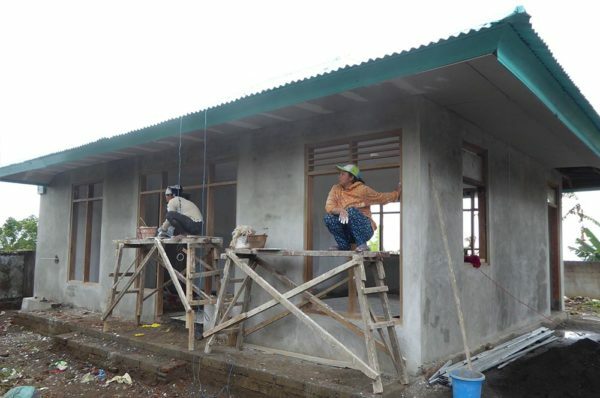 Inner walls were knocked down, windows were inserted to create a wide, open new school building. A strong new roof and ceiling as well as electricity and toilet facilities were also included. With an amazing new playground and 3D art work, the building was transformed! The school was then equipped with more supplies than children had ever seen before. 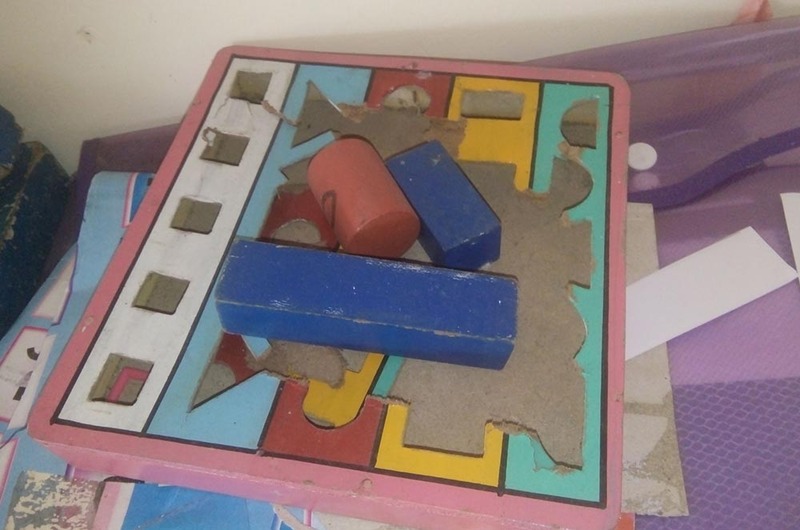 All that was left was to open the new school. How could we afford to make all these improvements? One word: Karmagawa. The new charitable organisation is shaking up perceptions of charity, focusing on engaging influencial personalities to make charity ‘cool’. In fact, Widya Kusuma Kindergarten is the eleventh school built by Karmagawa’s support in Bali, and 42nd worldwide. Karmagawa joined us to open the school, welcomed by a grateful community and excited children. And they brought a special guest with them – rising musician Bazzi. Bazzi was blown away by the difference in the school, but there was one more surprise. Revealing the new school, the name had been changed. 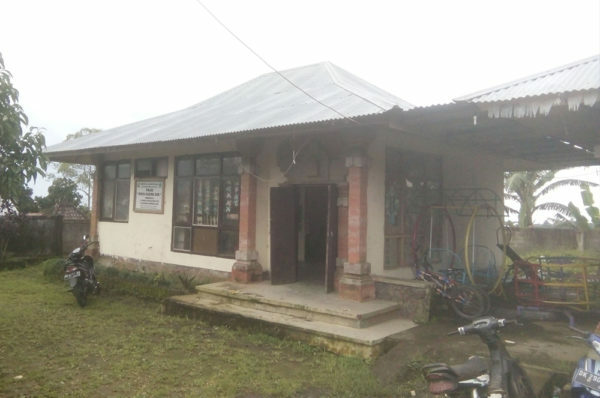 Widya Kusuma Kindergarten was now known as The Bazzi School as proudly painted above the schools’ doors. Children and community leaders joined for the day of fun, learning in their new school for the very first time. An impromptu painting class added to the fun, as Bazzi’s squeaky clean white Nike trainers become rainbow coloured, as children helped him give a new style to his shoes. 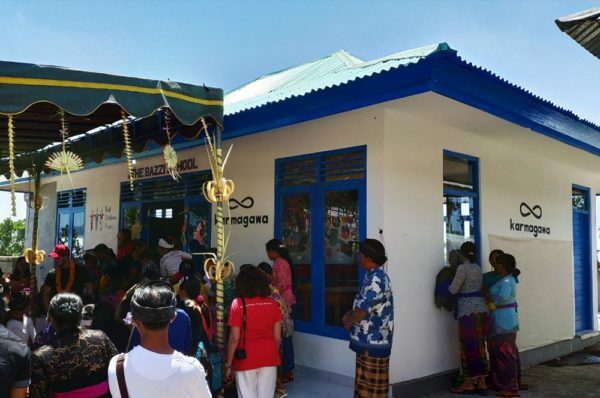 Our special relationship with Karmagawa continues, as we build and renovate more schools for needy communities in Bali – with immediate plans for another three schools and one learning centre to be built soon. 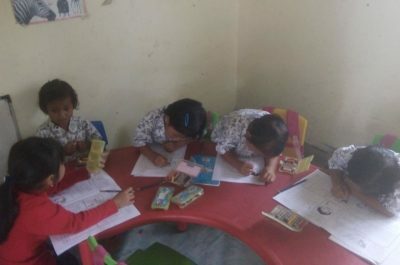 There are so many schools in Bali in need of support. You can help them too! 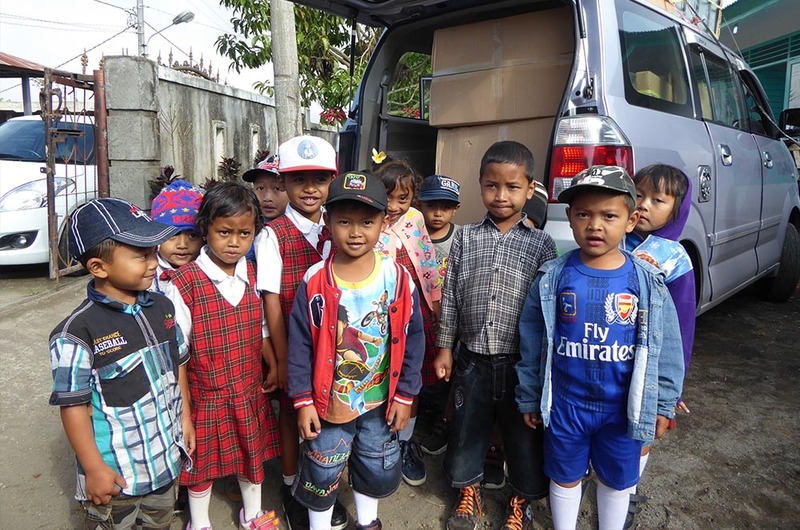 See our waiting list here or specify your donation to ‘schools support’ to help purchase supplies. There are so many kindergartens in Bali that need help with supplies, support and renovations. Please get in touch if you can help. Our schools support program finds communities that are dedicated to providing higher standards of early stage education. We work together with the community to transform their schools into amazing places to learn.